If you're looking to plant a tree that provides a nutritious snack along with natural beauty, a nut tree may be what you're looking for. You may want just one tree for your yard or an entire crop to harvest. Either way, the type of tree you choose depends on your climate, available space and personal preference. Macadamia nuts are creamy, with about 80 percent oil. Also known as the Australian or Queensland nut tree, the macadamia tree is native to the Queensland rain forest. According to California Rare Fruit Growers, the tree thrives in a temperate climate with steady, year-round rainfall without frost. Macadamias enjoy full sun or partial shade in a very hot climate. Protection from gusty wind is important. Frost protection is more important for younger trees, and macadamias thrive in deep, rich soil, though they'll survive in any soil that has good drainage. The tree is an evergreen and grows to 30 or 40 feet tall. Flower color ranges from cream to light pink, depending on which of the two the species planted. 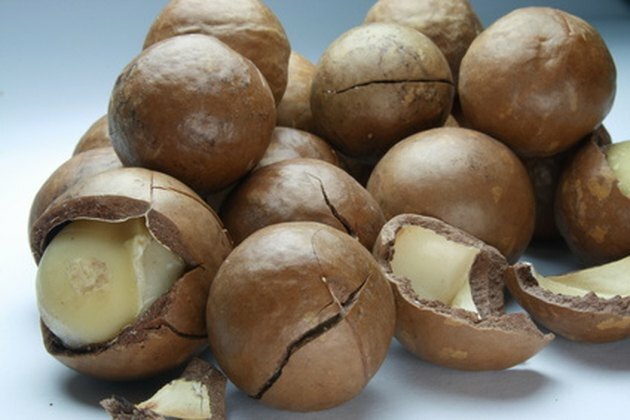 The macadamia nut is housed in a hard, green husk that splits open as the nut matures. The nut itself is 80 percent oil and 4 percent sugar. The nuts fall from late fall to spring. An average-sized tree produces about 30 to 50 pounds of nuts at 10 years of age. According to The University of Florida IFAS Extension, Native Americans cultivated pecan nuts for thousands of years before Europeans came to the New World. The tree originates from the Mississippi flood plains in North America, and pecan nuts are commercially cultivated in the Midwest and Southwest. Though the trees are common to Florida, nut production is low because of warm winters and high rainfall, which increases disease. The tree itself reaches upwards of 70 feet tall with a trunk 6 feet in diameter. Pecans grow well in hills, which provide adequate dryness and soil drainage, helping prevent disease. Pecans need plenty of room for their root structures, at least 60 feet between each tree. Overcrowding reduces crop size. The nut itself is liquid until it solidifies in the fall and is housed in a husk that eventually splits open. A 6-ear-old tree produces about 10 to 30 pounds of pecan nuts. According to the Arizona College of Agricultural and Life Sciences, almond trees bloom earlier than any other deciduous fruit or nut tree. The tree thrives in any well-drained soil as long as it's not salty. Almond trees should only be grown in areas that don't experience frost while the tree blooms, as nut production can be affected if the tree experiences a freeze. The tree is much shorter than macadamia and pecan trees, growing to only 15 feet tall. They tend to be round, needing little or no pruning. Almond nuts should be shaken or knocked from their tree. Waiting until they fall may cause them damage. Cultivators remove the hull and let the nut dry out. The nut should break when snapped. You can store almonds in their husk for up to six months in a cool, dry place. Emily Pate holds a Bachelor of Arts in theater arts and government from New Mexico State University. She has worked as a dance and substitute teacher, administrative assistant and in film and videogame production. She has more than 16 years of theatrical experience as an actor, director and playwright.